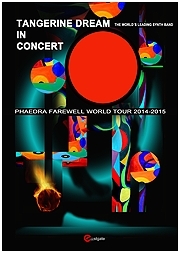 TANGERINE DREAM - TOUR PROGRAMME "PHAEDRA FAREWELL TOUR 2014-15"
THE two most requested items on our PHAEDRA FAREWELL TOUR here in Europe are now ready for shipping worldwide: The 44 page tour programme printed on high quality glossy paper and the new CUPDISC (EP) "Josephine The Mouse Singer" (length: ca. 35 min). For those of you who were unable to attend one of the European concerts within the last few weeks, this will be the last chance to get both memorabilias. As the numbers are limited and will not be reprinted, take a chance to purchase them right now. By the extention of the tour to other territories, there will be a different cupdisc and tour programme on sale. Good luck for getting the last leftovers asap. PS: The DIN A4 sized tour programme contains i.a. coloured and b/w pictures from the band from all periods - a wonderful historical overview of the band's creative phases within 47 years! SHIPPING START: 12 JUNE 2014!! !